Loss of cytoglobin is found to be involved in the progression of several human cancers. However, its expression pattern and biological roles in human ovarian cancers are not clear. 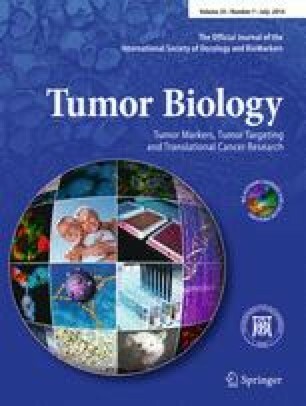 In this study, we examined cytoglobin expression in 118 archived ovarian cancer specimens using immunohistochemistry. A total of 72 specimens (61.0 %) showed cytoglobin downregulation. cytoglobin downregulation positively correlated with advanced FIGO stage and tumor grade. Cytoglobin plasmid transfection was performed in SKOV3 cell line and siRNA knockdown was carried out in SW626 cell line. MTT, colony formation assay and matrigel invasion assay were carried out to assess the role of cytoglobin on cell proliferation and invasion. Cytoglobin overexpression inhibited cell growth, invasion, cell cycle progression and cyclin D1 expression in SKOV3 cell line and its depletion promoted cell proliferation, invasion, cell cycle transition and cyclin D1 expression. In conclusion, cytoglobin is downregulated in ovarian cancers and associated with advanced stage. Our data provides evidence that cytoglobin regulates the ovarian cancer cell proliferation and invasion.